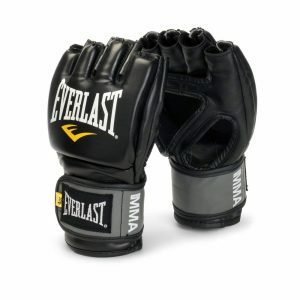 If you’re looking for the top MMA gloves, then you’re in the right place. With all the present options out there, I know how hard it can be to find the perfect pair. It’s possible you’ll even need different pairs depending on the type of training you’ll be doing. After all, we all have different ambitions. If you’re considering stepping into the octagon at some point, then you’ll need to be as prepared as possible. When your gloves, a solid mouthguard, and the ceremonious groin guard are the only things standing between you and your opponent, you want to make sure you’ve got the best of the best. Besides the importance of quality gloves for competition, you also want to keep in mind how easy it can be to injure yourself while training. This is a combat sport. The only way to get better is to simulate that combat. If you’re here, that probably means you’re not afraid of getting a little bruised up along the way. But you still want to keep yourself as healthy as possible so that you don’t get in the way of your own progress. The right gloves go a long way in making sure that you do just that. 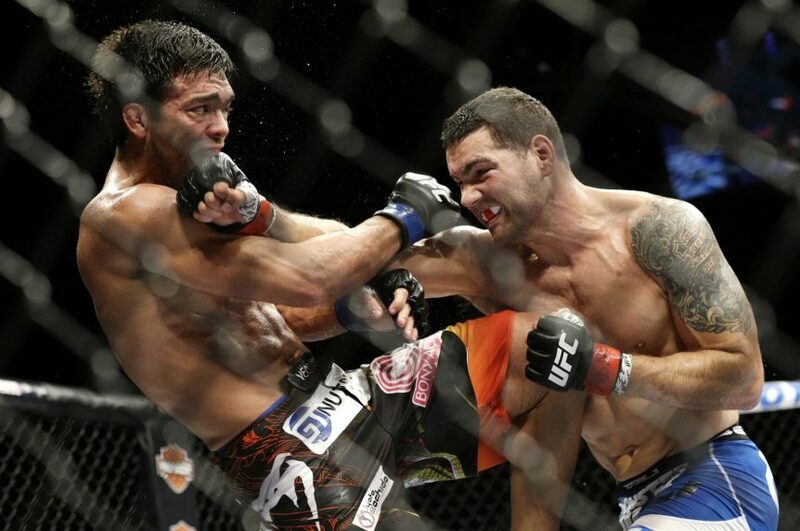 Now, that being said – mixed martial arts loves can be a bit on the expensive side. My advice here is to spend money on a pair that will do the job right and last you a good amount of time so that you don’t end up spending more money, in the long run, having to replace them constantly. There are plenty of options out there as a mixed martial artist. In this guide, you’ll get an in-depth look at the top gloves you can get your hands on (or in, depending on how you want to look at this). All fighting gloves are not created equal. Let me repeat that for the people in the back: ALL FIGHTING GLOVES ARE NOT CREATED EQUAL. It’s easy to look at gloves built for boxers and think – “I’ll save a few bucks by using those to practice my boxing and MMA”. What you have to remember is that this is a Mixed Martial Art. Striking is a big part of the game, but there’s a lot more to it. You’ll need to practice grappling, take-downs, ground game, and everything in between. Boxing gloves are simply not built for that. With gloves built specifically for MMA, you’ll be able to mix your style up accordingly to better replicate what you’ll be experiencing in a real fight. In order to get a size that fits, you will have to measure the circumference of the palm of your hand (excluding your thumb). Remember when I said that not all gloves are created equal? Well, that holds true here as well. Even if you understand why you need gloves designed with MMA in mind, you still have to take into account what you’ll be using that pair of gloves for. – Competition Gloves: These are the minimalists of the bunch. They have the least amount of padding and therefore weigh the least. Typically 4oz or less, these gloves separate the fingers allowing for more fluid movement and increased grappling ability. Hand wraps are pretty much a must due to the little padding provided by the gloves themselves. – Training Gloves: Training gloves are similar to competition gloves in that they separate your fingers in order to allow for grappling. The major difference is the level of protection. Since these are built to withstand more consistent punishment through training, the padding is more significant. – Sparring Gloves: MMA sparring gloves are built with protection in mind. 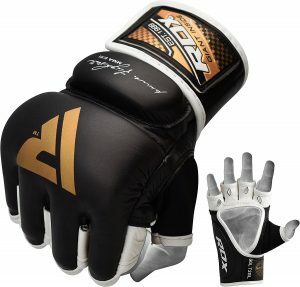 These have the most padding (averaging a weight of 7oz) than any other forms of gloves for mixed martial arts. With the focus on striking and punching, both heavy bags and sparring partners, these gloves are built to keep your hands and the gym buddies you’ll be punching in the face safe. If you’re sparring sessions are consisting of strictly striking work, boxing gloves are a fine alternative to choose here. – Synthetic vs Real Leather: Organic leather is king when it comes to durability and comfort. Naturally, this also makes genuine leather gloves more expensive than synthetic ones. Still, it could be worth the money to go for an option that will likely last you longer. Synthetic leather gloves can be great if you go with a decent brand, but generally, they’re not as good as the real thing. 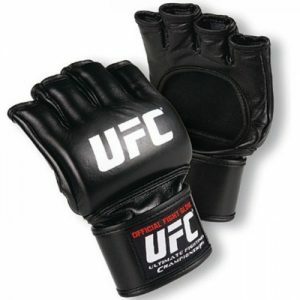 – Padding: Most MMA gloves are made with foam padding. Whether the foam is layered or applied regularly, the important thing to note is the quality of the foam itself. Cheaper foam won’t last as long as higher-quality foam. This is doubly important for competition and sparring gloves where striking is so important. – Wrist Strap: Velcro is a great choice for the wrist strap. You want your gloves to be secured tightly on your wrist while you focus on the task at hand. – Manufacturer: Another thing you’ll want to keep in mind while choosing which gloves to go with, is where they were manufactured. Due to the size of the combat sports industry in Thailand, they are known for making better quality stuff. Stay away from gloves made in China, Pakistan, or any other areas that don’t have a great reputation for quality. If you plan on sharpening your skills with some sparring sessions then it’s important that you protect yourself and your sparring partner. MMA gloves tend to lean towards the lightweight side of the tracks so you want to choose gloves that offer enough padding to keep you safe. Unlike boxing or Muay Thai, MMA consists of both stand up and ground game. So you’ll need to strike a balance between gear that’s flexible and gear that’ll keep you in one piece. Splitting up your striking and grappling can be a good idea in order to wear the more appropriate pair of gloves for each. But you also want to practice transitioning between the two in which case you’ll have to find a pair of sparring gloves that can handle both the high impact striking side of things and the more flexible grappling world. 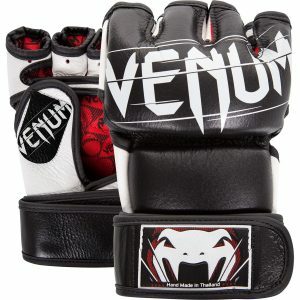 Venum’s Undisputed 2.0 competition gloves are easily one of, if not the top, MMA gloves out there right now. Everything about these gloves is of top-quality. From the top of the line leather to the high-density stitching, these gloves feel at home on your hands. The layered foam padding creates a comfortable fighting stance for your hands that will take a bit of a breaking period to get just right for you. The wrist support extends high and is secured firmly by lengthy velcro system. All in all, these gloves are exactly the type of quality you’d expect from a reputable Thailand manufacturer like Venum. One of Hayabusa’s top 4oz competition gloves, the Tokushu Regenesis is designed for an easy fit and comfort. The thumb slit design and the curved knuckle functionality make these gloves extremely easy to use. With odor resistant material lining the inside of the gloves, you can also rest easy knowing that you won’t have the grossest gloves in your gym. The external material is composed of synthetic leather which is marketed as being tougher and stronger than the real thing. So far, the jury is out on this claim but they’re definitely on to something here. All that being said, these are one of the pricier gloves on the market right now. Going as high as 2x the price of other competition gloves out there. But, if you’re looking for quality, and you’re willing to pay extra for gloves that will do just as much work as you are then these might be your ideal pick. 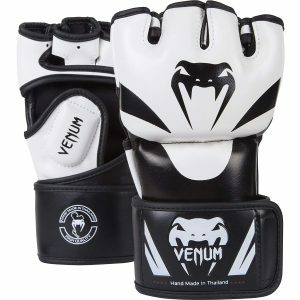 Another Venum pick – the Venum Attack MMA gloves are fit for both competition and training. Made out of their premium ‘Skintex’ leather, this is a pair that will keep your hands nice and safe for a very long time. The inside of the gloves is layered with high-density foam padding that provides impressive protection from impact. Equipped with a long velcro system on the wrists to allow for a more customized fit will secure a snug fit whether you’re wearing hand wraps underneath or not. The Venum Attack also comes with a rather rare thumb padding which can come in handy depending on your fighting style. So if you like the black/white look (it’s the only option they offer) and are looking for a new pair of dependable competition gloves, this is a pair that I highly recommend. I’ll be honest here – there’s no way I could have in good conscience put this list together without including the Official UFC Fight Gloves on it. If you have any aspirations of ever going pro and hitting the big stage, you better get nice and comfortable with these gloves. With an open thumb and palm design for optimal grappling, this is THE pair worn by fighters in all UFC bouts. Equipped with multi-layered foam and curved knuckles for both comfort and impact absorption, these gloves are on par with any of the top brands. Pick these up if you want to simulate what it would be like to fight like the pros. No surprise here with another Venum pick. The Challenger model is almost identical to the #3 pick above but with a more affordable build. Instead of the ‘Skintex’ leather used for the Attack model, these gloves are made with a cheaper Polyurethane leather instead. Compromising a little on the durability in order to keep the same level of protection with the layered foam padding of the Venum Attack. Padded thumbs are incorporated this time around with a wrist strap long enough to wrap around twice over for that feeling of extra secureness. Also unlike the Attacks, the Challengers come with 4 different color options to choose from. When it comes to training and grappling gloves, RDX has some great choices. Their T2GL line being one of their best. Crafted with real leather, this model uses multi-layered gel for improved shock absorption. Fighters love to use this pair for bag training because of the extra padding that it offers. Helping to protect your hands better than competition gloves while still offering enough flexibility for grappling. They have a longer finger covering that reach up to the 2nd knuckles and thumb sleeves that protect most of your thumb. Leaving a triangular opening on the palm which helps with increased control. 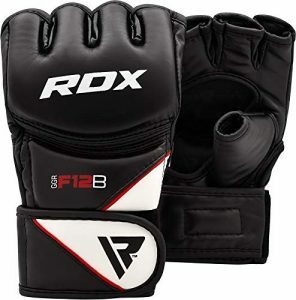 Similar to the T2GL, the F12 are MMA gloves designed for training. 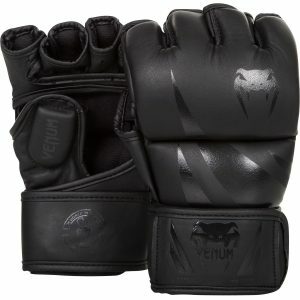 A bit cheaper than their counterpart, these grappling gloves use a brand of synthetic leather (Maya Hide) instead. They also switch the more advanced gel technology with a standard layered foal. Despite those changes, the F12 still covers up the same portions of the hand that the T2GL does. So your fingers and thumbs are protected up to the 2nd knuckle and only knuckle respectively while leaving some room on the palm for maximum flexibility. With options in black, blue, red, and pink; the RDX F12 is a great alternative for those of you looking for a better deal without compromising too much on the quality department. Consider these the budget option of the group. More geared towards grappling training, you’ll be free to deal as much punishment to these gloves without feeling too guilty about wasting your money. With a straightforward and simple design, these gloves have a single foam pad that stretches across the back of the hand to the fingers. There are no thumb sleeves but it does come with an open palm design that incorporates a diagonal connection that helps to keep your hand secured within the glove. Offering ample protection when grappling but not ideal for striking or bag work. Making its final appearance on this list, Venum strikes again with another exceptional product. 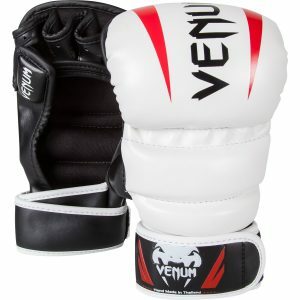 The Venum Elite MMA gloves are sparring gloves created explicitly for MMA. Keeping their weight down to 7oz instead of the heavier/bulkier options for boxing and Muay Thai. These gloves have a really nice finger compartment that I love underneath the exterior padding. Made with Venum’s premium Skintex material, you can expect the level of durability and toughness that Thailand glove manufacturers are known for. The wrist system consists of both an inner velcro strap which is followed by an outer strap that further secures the glove to your hand. Consider going a size up than what you would normally go with. 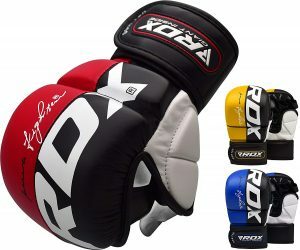 Coming in for the 3rd time is RDX with their T6 sparring gloves. A solid offering with synthetic leather that won’t leave as much of a hole in your pocket. It uses a layered gel padding for shock absorption and impact protection from striking. The inside of the gloves has an open design where your fingers and thumb are pretty much the only things being covered. Allowing for the ability to grapple while sparring. Finally, the wrist strap is more than long enough to provide both protection for your wrists and a snug fit regardless of how aggressive those sparring sessions get. 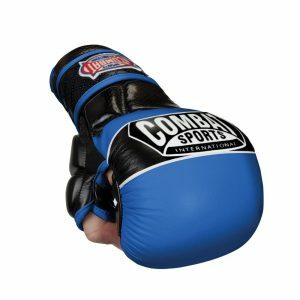 Featured on The Ultimate Fighter competition, the Combat Sports Max Strike is a popular choice in the MMA world. 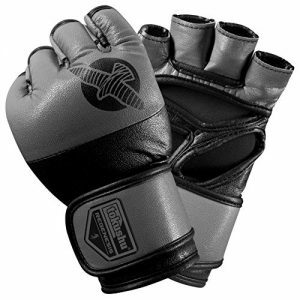 Approximately 7oz, this glove consists of genuine leather and top-notch padding for striking. Identical in almost every way to the cheaper Combat Sports Safety Sparring Gloves except for the higher quality use of materials. Giving fighters an option to choose the option that’s right for them. MMASentinel.com is a participant in the Amazon Services LLC Associates Program, an affiliate advertising program designed to provide a means for us to earn fees by linking to Amazon.com and affiliated sites.